Earth's dynamic molten outer core generates a magnetic field that shields the planet from the sun's radiation. UMD and JQI researchers have proposed a way to simulate this so-called dynamo with fast-flowing electrons in a tiny piece of metal. A powerful engine roils deep beneath our feet, converting energy in the Earth’s core into magnetic fields that shield us from the solar wind. Similar engines drive the magnetic activity of the sun, other stars and even other planets, creating magnetic fields that reinforce themselves and feed back into the engines. Much about these "dynamos," as scientists refer to them, remains unknown. That’s partly because the math behind them is doubly difficult, combining the complex equations of fluid motion with those that govern how electric and magnetic fields bend, twist, interact and propagate. But it’s also because lab-bound dynamos, which attempt to mimic the astrophysical versions, are expensive and dangerous and do not yet reliably produce the signature self-sustaining magnetic fields of real dynamos. Now, Victor Galitski, a professor of physics and a fellow of the Joint Quantum Institute (JQI), in collaboration with two other scientists, has proposed a radical new approach to studying dynamos, one that could be simpler and safer. The proposal, which was published Oct. 25 in Physical Review Letters, suggests harnessing the electrons in a centimeter-sized chunk of solid matter to emulate the fluid flows in ordinary dynamos. 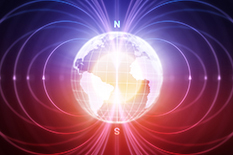 If such an experiment is successful, it might be possible for researchers in the future to study the Earth’s dynamo more closely—and maybe even learn more about the magnetic field flips that happen every 100,000 years or so, when the north and south magnetic poles essentially switch places. “The dynamics of the Earth’s dynamo are not well understood, and neither are the dynamics of these flips,” Galitski said. Experiments to simulate the dynamo would be impossible but for the fact that electrons, which carry current through a material, can sometimes be thought of as a fluid. They flow from high potential to low potential, just like water down a hill, and at different speeds. The trick is getting them to flow fast enough without melting the material. Those fast flows are important for realizing the dynamo effect in the lab, he said. Turbulence seems to play a crucial role in the creation of a dynamo because it leads to chaotic fluid motion; this in turn can jostle the magnetic field loose from the rest of the fluid, causing it to twist and bend on top of itself and increase its strength. But turbulence only arises for very fast flows—like the air rushing over the wing of an airplane—or for flows over very large scales—like the liquid metal in the Earth’s core or the plasma shell of the sun. To create a dynamo using a small piece of solid matter, the electrons would need to move at speeds never before seen. Galitski and his collaborators think something called a Weyl semimetal could host an electron fluid flowing at more than a kilometer per second—potentially fast enough to generate the turbulence necessary to bootstrap a dynamo. These materials have received broad attention in recent years due to their unusual characteristics, including anomalous currents in the presence of magnetic fields that may reduce the speed required for turbulence to emerge. It’s not yet clear how best to kick-start a dynamo on a sliver of Weyl semimetal. It may be as simple as physically rotating the material. Or it could require pulsing an electric or magnetic field. Either way, Galitski said, the experimental signature would show a totally nonmagnetic system spontaneously form a magnetic field.